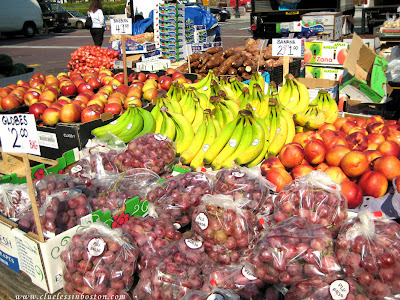 Here is another picture of some of the fresh fruits on sale at Haymarket. Be careful if you stand if front of any of the stands or there's no way you can go away empty handed! Between you and Fenix, I'm hungry!!!! And it's just about bed time. Thanks for the great Haymarket series! Great market photos. Love what you and Fenix are doing here. I took some food photos in Menton the other day - you've inspired me to put them on during the next few days. Wow, everything looks great here, this is a fabulous market. It's amazing how the prices vary from stand to stand. I've never been there in the afternoons when the vendors mark everything way down, have you? This year the market seems a lot tidier/cleaner, too. Colorfull and graphical photo : I like it !